Trekking holiday in Kyrgyzstan with Joker travel organisation. We left from Brussels Airport and parked our car on the Discount Parking of Brussels cargo. We did this plenty of times and everything goes smooth and it’s one of the cheapest solutions. We paid 84 euro for 23 days of parking. There is a shuttle bus every 5 to 10 minutes and it takes about 10 minutes to be dropped off straight in front the terminal. We took off in Brussels Airport and had a relative short lay-over in Istanbul before landing early morning the next day on Manas International Airport in Bhiskek. Due to summer time there was a time difference of 4 hours. From the airport we had a shuttle that brought us directly to Naryn starting over good roads, but changing towards very bad roads. I will not forget the little bumps they have everywhere which you really have to cross at 2 km/h. We had a home stay at our guide his place before taking off the next day for our first trekking. The home stay was very simple and in fact we slept on our travel mattress in a room. We had a shower so we were already happy. The first day of our trekking we left in our guesthouse for a walk of approximately 25 kilometers to stay in our first yurt camp. The walk started of fairly easy and was rather flat. Nevertheless, we were happy to arrive after 25 km. We had a yurt to eat and a yurt to sleep. A yurt is a very basic round tent and you mostly sleep in your sleeping bag on a small mattress which you should bring yourselves. Out there, in the middle of nowhere, we could clearly see the Milky Way in the evening. Something which is not possible where we live. 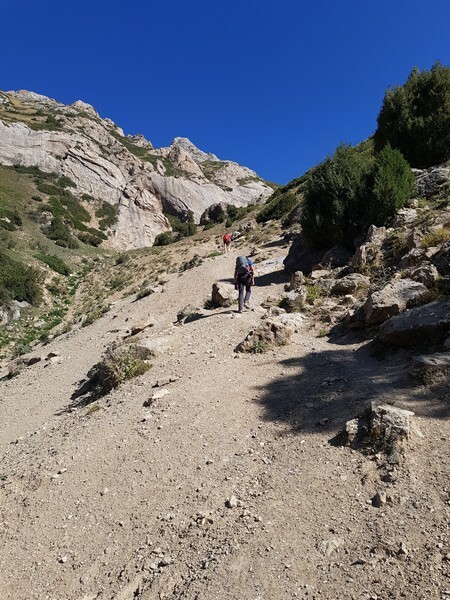 The second day we had to start with a very steep climb with over 800 meter in less than 4 kilometers. Not to be underestimated! We arrived on a kind of plateau which we crossed. In the evening we played volleyball with the hosts of the yurt camp. It’s nice to mingle with the locals, as that’s the best way to learn about a country. We had a tough start, but then we had a fun game. We could only stop when the lady of the house made it clear, on the third visit, that the food was ready. When we arrived we were invited to join some local nomad games. Not to be compared with the official World Nomad Games, but it already gave a very good impression of how hard these games must be. 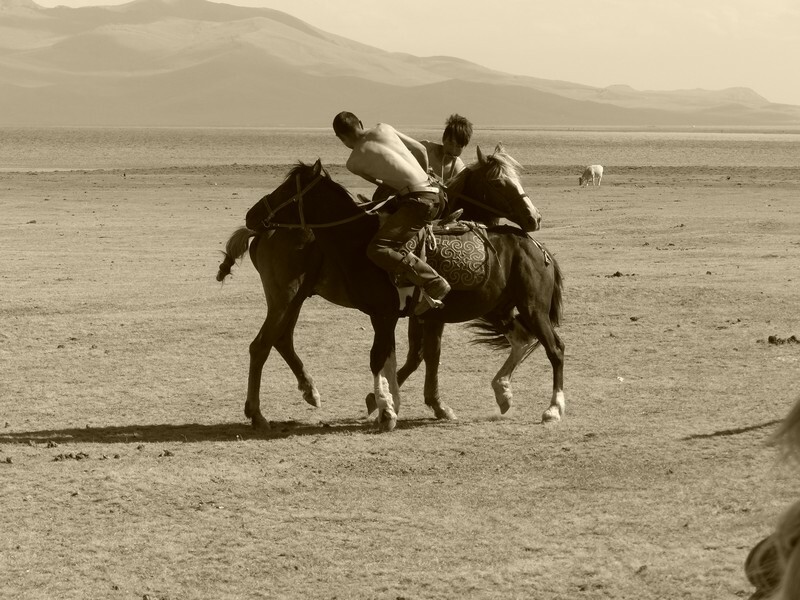 The athletes wrestle in person or from a horse back, take money from the ground while riding a horse or played a kind of polo with the body of a sheep. A sheep they captured and decapitated just before the game. After the Nomad games we went for a swim in the Song-Kul lake which was freezing cold. We advise to take your sandals to swim, as there are some rocks in the beginning, but also some kind of seaweed on the bottom. I prefer not to do that bare feet. Anyway, we kept the swimming session short as the water was too cold. The fourth day we had a relative short, but steep climb to reach the pass on an altitude of around 3400 meters. The sky was clear and the view astonishing. There was a lot of wind on the top so don’t forget to take a jacket for that. Then followed a steep decent where several parts had small gravel, so be careful. When we came down at around 2200 meter the shuttle was waiting to take us to guesthouse Mira, located in Kochkor. We were happy to have such a nice place after a 4 day trekking. A bed, a shower and in-house toilet. Those basics for most people felt like heaven for us at that moment. It makes you realize once again how good we have it at home. From Kochkor we left with our shuttle towards Tash Rabat where we stayed in a yurt camp with beds. The camp was about 1.5 km away from the Caravanserai building. As we arrived a little earlier than expected we had time to already visit the historical monument. The building was first closed, but when the old lady noticed us, the hurried up to open up the building and to start selling some tickets. Entrance price was 90 SOM (approx. 1.1 euro). If you are around, don’t doubt to visit this one. The visit will easily keep you busy for a half an hour. The next day it was time to start our second trekking. 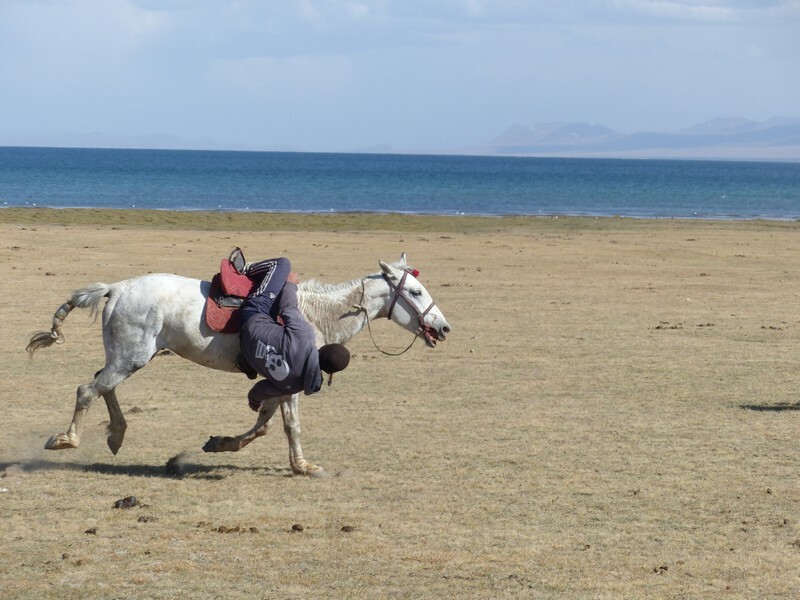 For this horse trekking I had quite some doubts as after my last ride in Tunisia (2006) I said I would never sit again on a horse. I love to see horses, but riding them is not my thing. However, after a lot of thinking I did decide to take a ride as we had the option to partially walk and partially ride the horse. The horses seem to be used to this and the hard under ground full of rocks. They find their way, but I had some mixed feelings when we crossed yet a rocky part. For Marie-Claire it was easier. The loves to ride horses. She did just fine. For me it was ill at ease but as time passed I got more and more comfortable and started to enjoy. After lunch we had a steep climb and a pass to cross, and nobody did that on the horses for safety. When we reached the top we were just above 4000 meters of altitude. The view was magnificent. We could see the mountains situated in China. What followed was a very very steep decent. We realized that tomorrow, when we came back on the same road would be heavy. We ended the day at a yurt camp near the lake, but were not allowed to go to the lake, as it’s a restricted area and some signs are present. Not sure if they really do checks on this, but still. We didn’t take the risk and decided it was time for aperitif with some Vodka. Either there was a last minute booking, or the hosts of the camp saw an extra opportunity, but he overbooked the place according to us. We ended up with 10 people in a yurt. where it should have been 5 persons per yurt. We were stacked one next to the other, but it gave the group feeling an extra boost. It also shows that on these kind of travels you have to be flexible. The next day we left in the morning and returned the same road. That is a pity as we don’t really like two-way hikes. As we saw day before the end of the climb was really, really steep. We reached once again the top and then followed a long decent back to the yurt camp. 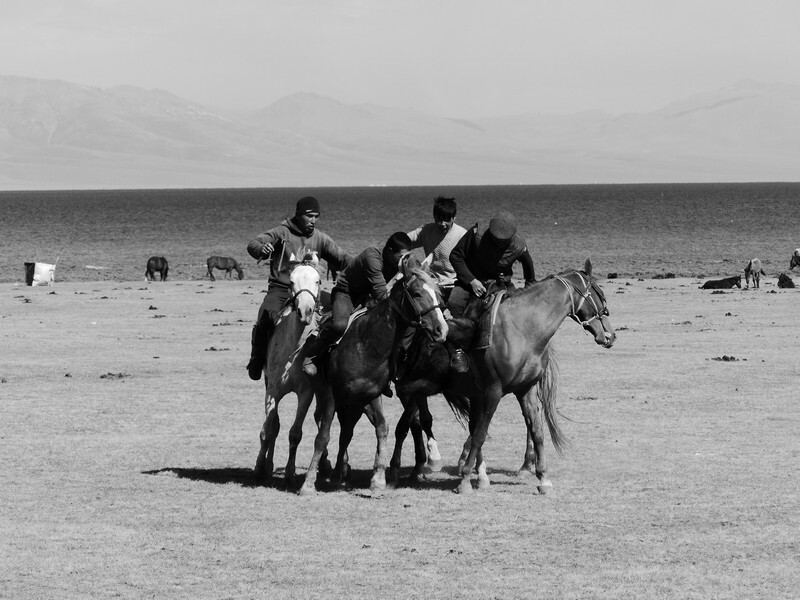 As the transfer from Naryn area to Karakol was quite long we had a stop over at the Issyk-Kul Lake in the Bel Tam Yurt Camp. The yurt camp feels a bit luxurious when you come from the camps in Naryn area. It’s overall all good, but like I read on some TripAdvisor reviews, they could easily improve a bit. You see the bake if the wood oven fresh bread which smells incredible good, but still, at breakfast you get old bread. Showers are nice and there are even western flush toilets. The bar looked very nice, but in the evening the weather was not good enough to sit outside, so we went immediate to the big dinner yurt. When you leave the camp behind the bar and go straight, you end up at some small beach at the lake. There you can easily go in the water. During our visit that was nice to do and not too cold. Nothing to compare with the ice cold water of Song-Kul lake So when you are around, take the time to visit and swim in the lake. In the morning we were picked up by an old 4×4 Soviet truck who brought us to the starting point of the truck. We started the first day in the forest and after 11 days of nice weather we started the day with gentle rain. Luckily it stopped at noon. We enjoyed the views on the lake, which were exceptionally beautiful due to the snow. Also the color of the water changed about every 5 minutes. We had a lunch at the lake side before heading towards the viewpoint and were impatient to start climbing as clouds were approaching. The view point does not look that far, but should certainly not be underestimated. The combination of the altitude and the steepness of the climb in the snow made it was not a walk in the park. However, when you finally reach the viewpoint, you are rewarded with an incredible 360 degree view. Our incredible fun group for 23 day Kyrgyzstan expedition. Second row: Saartje, Nick, Tom, Lien, Robin, Marie-Claire. First row: Mattias, Dirk, Joke, Hannah. A special appreciation goes to Dirk, who did all the crazy stuff together with our group, but was close to the double of age of most of us. I hope Marie-Claire and I can still do the same when we are 60+. After taking the time to enjoy the surroundings, taking some pictures, we had do decent on the other side. It is known that this decent is quite dangerous as normally there is loose gravel and the gradient is enormous. However, we had the snow, which made it kinda fun to decent. The snow was on some place more than 0.5 m deep. In the beginning you had to be extremely careful, but as we went further down, some us went faster and faster. I enjoyed it big time! After the decent we had another hour walk before reaching the camp place for the night. First time sleeping in a tent in the snow for us. Once the sun was gone, it became cold, very cold… Around 19:00 temperature was -3°C and during the night it went further down till -7°C. Luckily Marie-Claire and I invested in new sleeping bags with adapted temperature threshold and we had a good night. Next morning, we continued our journey in the direction of Altyn Arashan which is famous for its natural hot springs. We went further down and from the open areas we went through the forest to reach our final destination of the day. After storing our material we went by foot to the natural springs. You might need to search a bit for them, but once your are close to the river, you can’t really miss them and there are 4 places where the have created small ponds with stones where you can go in the water. The water is around 30°C and in the last one of the four, there is a hose with even warmer water which you can use to warm up your body. In most of them you fit with either 2 to 3 people. The last one, in which we sat, you can fit 6 persons, but that is really the maximum. 4 would be more suited. After returning we went to the exploited hot springs where you can rent a room with a bath which is getting warm water from the hot spring. When we arrived the water was extremely hot. You can close the whole where the water enters the pool and then at least it’s not getting warmer. It took us about 20 minutes to sit in the pool as it was that warm. I’m used to take hot showers with above 40°C but the pool must have been somewhere around 46°C or even more according to us. Only at the end, we found out that you can take cold water outside to cool down the pool faster 🙂 It costs you 400 SOM per person (around 5 euro) and it’s worth doing that. Don’t expect any fancy building or Western sauna complex. This is really basic. We recommend visiting both hot springs, but advise to start with the natural ones, as they are colder. In the evening we had dinner in the big yurt which is also known as the party yurt. They have a big blue tooth speaker on which you can connect and play songs. They have a bar with premium Vodka for 350-450 SOM and beer for 100 SOM. We partied till midnight and after a short night we continued our trekking with the last day where we walked almost all day next to the river. We finished with a lunch next to the river and were picked up by a 6 x 6 truck which brought us back to Karakol. The toughest part was kept for the last trekking. 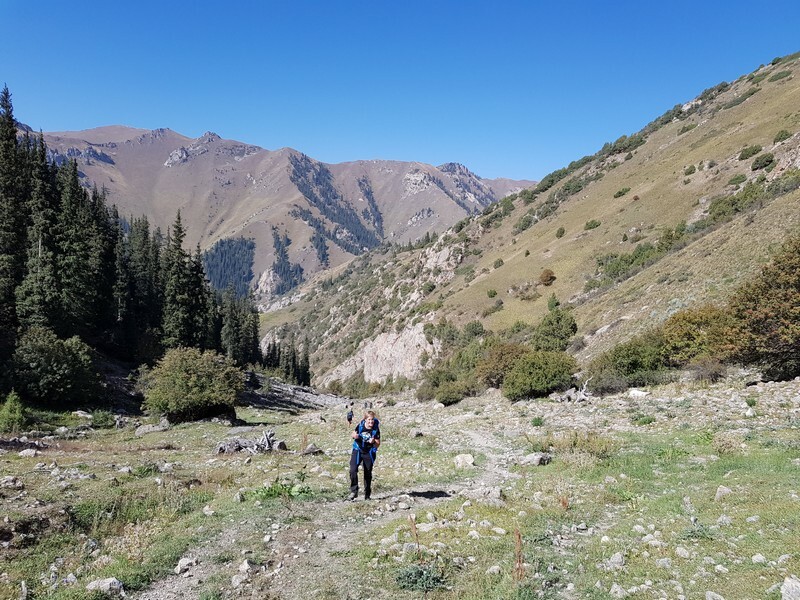 A 6 day trekking in the Echkili Tash Valley where we would to the highest point of this trip and see the biggest glacier of Kyrgyzstan. We were again picked up by the truck at our guesthouse and a journey of 5 bumpy hours was awaiting us. 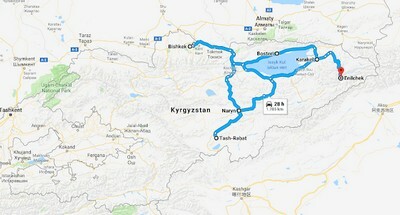 For this trip you need permits and you pass 2 military check points. It was all arranged for us by CBT Karakol. We were dropped at our first camping stay in late afternoon and made a relatively easy walk in the area. Second day we had a 21 km track waiting for us where we had to cross twice a river. For that it’s convenient if you have Teva or sandals if you don’t want your walking shoes to be wet :). During this trip we came again across some wild horses which are awesome to see. They sound they make is so nice to hear. 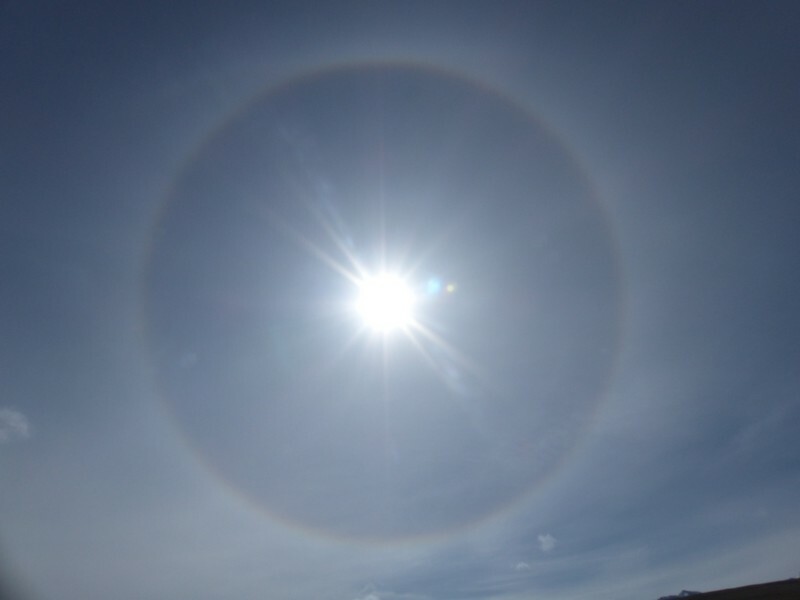 The weather was awesome and we saw a halo around the sun. I never heard of this before and it was really nice to see. Seems it also means that we were heading for a cold night. Day number 3 was the day to attack the Tuz pass, and go to the highest point of our trip. We again came on the altitude of the sun and most of the climb to the pass was in the snow. Adapted material is handy to avoid your pants get wet. The climb is pretty intensive and the pass itself goes up to 4020 meters. From there you can climb further to the top for a 360° view on an altitude of approximately 4227 meters. It speaks for itself that the last meters are quite hard and in the end also a bit tricky. But you are rewarded with a magnificent view. Even if there are some clouds you can still see a lot. Going down is really fun as you have deep gravel, so you can kinda jump and slide down. Deep gravel is not that dangerous. It’s only when there is little gravel that you have to pay attention. When we went further downhill, you are already after a couple of meters rewarded with an amazing view. One of the best of our trip. You see the valley which leads to the glacier and you see mountains between 5000 en 7000 meters. The picture is not bad, but as often the picture can’t represent the reality. It’s also not often that you can see such a difference in altitude. When you are on the mountain, you don’t see the difference. Here you clearly can. Dag 4 was a walk from the camp at the river towards the glacier. You will face rocky surface so your speed is not that high and you will have to cross the river. We found a point where we could do it on rocks as the river was not that deep at our crossing point. The area just in front of the glacier is changing a lot. Sometime we felt like on the moon and a bit later it felt like a garbage belt as the colours of white and black made us think of that. Not that you can find any garbage there. The glacier is hidden below rocks but at some points you can clearly see the glacier. It was a special view, as mostly you think of a snow glacier. The Engilcheck Glacier is the biggest one of Kyrgyzstan and is a glacier under rocks. Very special to see. Our guide took us on the glacier so several nice points. You really need a guide in here as there are a lot of holes where you could fall in. So if you are ever there, stay close to the guide and follow his exact route. It was quite a heavy day as on the glacier you are constantly climbing and descending on the rocks. Day 5 was following the river and across that one we visited a canyon. There you can again use your sandals as the water is to deep to cross with hiking shoes. Walking sticks are convenient as the water was quite strong the hour we arrived (close to noon). They help to keep your balance. We went around 150 meter in the canyon. You can go further, but it doesn’t change that much anymore. At the end there is a small waterfall we heard, but not that impressive. So I leave it up to you if you go further or not. Then you can judge for yourself. Day 6 was the long awaited D-Day as we had to cross the “killer river”. In summer time this ice cold river, fed by the snow is meters wide and it’s known that when you cross the river bare feet on your sandals your toes almost freeze off by the time your reach the other side. As we were late in the season that was quite OK. The river was about 15 meter wide, but you had a zone in the middle were you could get of the water. It was indeed very cold, but we survived. From there we walked another hour or two before getting in the truck for another 5 hour bumpy ride. And when I say bumpy, I really really mean bumpy. Never had such rough terrain with a truck for so long. We concluded this awesome experience with coffee and beers in Karakol Coffee. One of the most known (tourist) bars. Nice things, but service is not that friendly according to us. From Karakol we headed to Bishkek but now we took the north side of the Issyk-Kul lake where they have a decent route. This is also the area where the Nomad games were hold. We arrived around noon in Bishkek where we slept in a simple guesthouse with a lovely host. From the guesthouse it was a 10-15 minute walk to the real city center. We visited most famous land marks in the center like the statue of Lenin and more, but I would recommend Bhiskek for a city-trip. It was nice to visit it, and it kept us busy for 3 – 4 hours. The last is not the favorite one, but it’s part of the deal. We left the guesthouse in the morning, back to Manas International Airport which was a 30-40 minutes drive. Don’t expect too much of this airport as it has only few shops. However, Gin was favorable priced. From there we went to Istanbul where we had little less than 2 hours to kill. We boarded on time but were stuck on the tarmac for quite some time. We arrived little less than a hour late in Belgium.